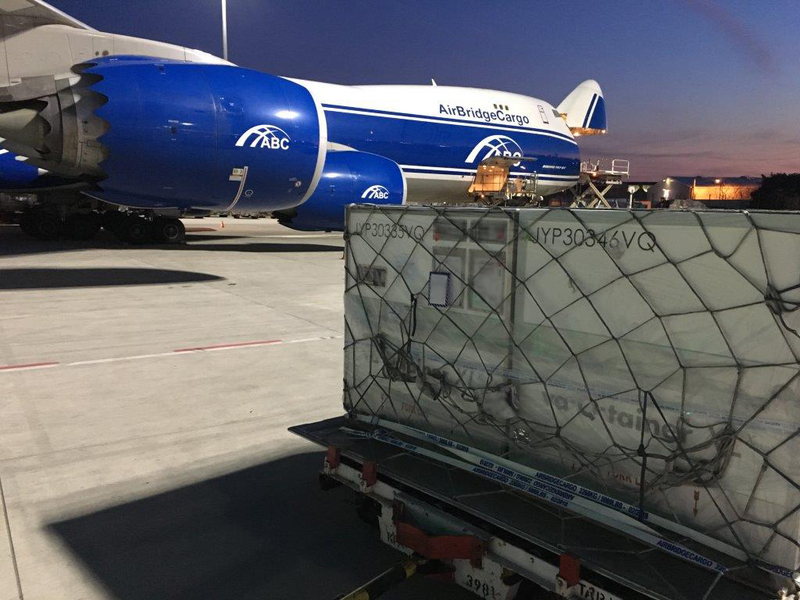 AirBridgeCargo Airlines (ABC), one of the leading transporters of pharmaceuticals by air, has carried a record 19 va-Q-tainers XLx onboard a single flight, delivering products for its European customer, BIOTECH & PHARMA LOGISTICS GmbH (B.P.L. GmbH). The 19 high-performance passive containers, weighing around 15 tonnes in total, were delivered to Frankfurt ready to ‘load and go’ onboard one of AirBridgeCargo’s Boeing 747-8F services to their final destination in Moscow. ABC’s dedicated pharma team of highly-skilled and qualified specialists monitored each step of the transportation process, starting from priority booking for all 19 containers through to overseeing the loading procedures on both the freighter’s lower and main decks, guaranteeing the exact temperature range required for the delivery, as well as a seamless offloading at ABC’s cargo hub at Moscow Sheremetyevo airport. Additional support was provided by ABC’s Control Tower specialists, who managed real-time, round-the-clock monitoring of the flight, including the temperature of the cargo to ensure no deviation during transportation. All preliminary workflow, ground handling operations, and loading procedures for this complex shipment were accomplished with the assistance of abc Pharma specialists in Europe. “This is the first time AirBridgeCargo has provided a logistics solution for so many passive containers on a single flight and we are delighted that the delivery was achieved so smoothly, seamlessly, and, most importantly, in compliance with our customer’s expectations and requirements. This is another example of our pharma team’s expertise and accumulated experience in international pharma logistics. We are constantly reviewing our services to align them with the expectations of our customers and the wider pharma market in order to improve our operations, such as introducing the most advanced technologies to further enhance the quality of our services as well as each customer’s experience of working with us,” highlighted Fedor Novikov, Global Director, Pharma for AirBridgeCargo Airlines. AirBridgeCargo is continuing to enhance its abc Pharma product offering, which saw volumes rise by 80% year-on-year in the first quarter of 2018. The airline has created a multifaceted approach towards the development and enhancement of its abc Pharma product, embracing alignment of internal procedures and processes, and the reinforcement of its international sales and operations teams, as well as the implementation of digital solutions to make the pharma transportation process as easy, transparent, and understandable as possible for customers. ABC anticipated future growth and success, especially for the delivery of pharmaceutical products, is based on openness, cooperation and collaboration on all levels. This includes working with partners with the same corporate focus and commitment to data-sharing among all supply chain stakeholders.